ICEJ Braces For Thousands Of Feast of Tabernacles Visitors - Breaking Israel News | Latest News. Biblical Perspective. Known as Israel’s largest single tourism event of the year, the International Christian Embassy Jerusalem’s (ICEJ) Feast of Tabernacles which takes place each year during Sukkot, might be the ICEJ’s highest profile event, but their work to support Aliyah is truly at the heart of the global ministry’s efforts throughout the year. 5,000 Christians from over 100 nations are expected to descend on Jerusalem for the annual Feast of the Tabernacles to celebrate the holiday of Sukkot alongside Israelis and Jews around the world. The event is expected to generate $16 million dollars in revenue for the State of Israel. The ICEJ was founded in 1980 in response to worldwide diplomatic protest of Israel’s official declaration of Jerusalem as its undivided and eternal capital. When embassies in Jerusalem were being closed left and right, a group of Christians living in Israel decided to open their own “Embassy” in Jerusalem. 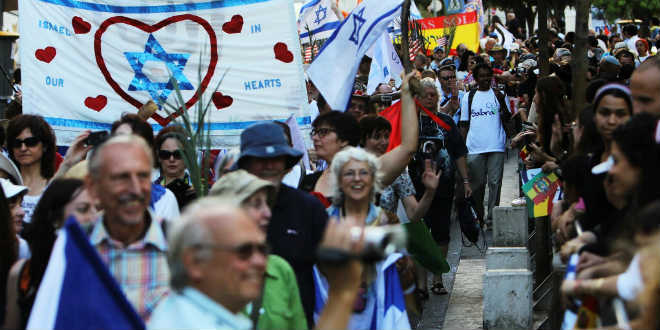 It was a symbolic show of support that quickly turned into tangible support for Israel and Jewish people around the world. Since the fall of communism and the flood of Jewish emigration from Soviet countries, the Christian Embassy has actively supported the return of the Jewish Diaspora to their historic homeland. They have sponsored 54 chartered flights in addition to numerous group and individual flights, helping over 110,000 Jews from all around the world return home to Israel. The dedicated employees of the Embassy have worked tirelessly, hand in hand with their Jewish neighbors, to witness the realization of Biblical prophecy in modern Israel. Most recently, the ICEJ has cooperated with Israel Returns, an organization founded by Michael Freund, to support the immigration of the Bnei Menashe community from India back to Israel. Over one thousand members of this lost tribe successfully arrived and settled in Israel in 2007 but there are 7,000 more that are anxiously awaiting for the results of an upcoming Israel cabinet vote whether to allow them to return home or not. In light of their steadfast commitment to Aliyah, Christians all over the world are partnering with Israel Returns during the Feast of Tabernacles to participate in the Four Corners Prayer Journey calling Christians and Jews worldwide to pray for the final ingathering of Jews from the four corners of the world back to the Land of Israel.